You'll be £35.00 closer to your next £10.00 credit when you purchase Dreadnought to Daring. What's this? Dreadnought to Daring is an absorbing and highly readable summary of a century of naval thinking which has been written by some of the leading lights in contemporary naval history. Founded in 1912 by some of the Royal Navy's brightest officers, the quarterly Naval Review has never been subject to official censorship, and its naval members do not need official permission to write for it, so it has always provided an independent, lively and at times outspoken forum for service debate. In broad terms it has covered contemporary operations, principles of naval warfare, history, and anecdotes which record the lighter side of naval life, but sometimes with a bite to them. A correspondence section provides an important barometer of service opinion, while extensive book reviews, written by those with real knowledge of the subject, carry considerable weight. For these reasons the Naval Review is widely regarded as a journal of record. In return for its freedom, circulation is restricted to members and membership to serving or retired officers. However, this volume will give the interested public an insight into its activities, past and present. Intended both to celebrate and to analyse the impact of the journal over its 100-year history, it comprises a series of specially commissioned articles, divided chronologically and thematically, devoted to subjects that have been of importance to the naval community as reflected in the pages of the journal. It concludes with an assessment of how well the Naval Review has succeeded in its founders' aim and what influence it has had on policy. A fine piece of work and a real tour de force. Provides an interesting, wide, yet comprehensive and balanced coverage. A remarkable achievement and will undoubtedly become a key work of reference for all serious naval historians. 29 of todays most renowned naval commentators have come together to celebrate and analyse the impact of naval thinking covered by The Naval Review. 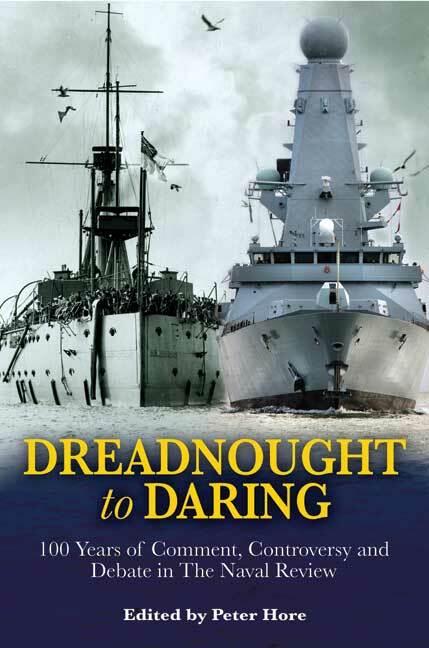 Dreadnought to Daring is a fine, accessible work, written by 31 recognised academics, maritime authors and naval officers, and covering covering the past century of both the Naval Review and the Royal navy. Founded in 1912 by some of the brightest officers of the Royal Navy and first published in 1913, the quarterly Naval Review has never been subject to official censorship. Its naval contributors do not need official permission to write for it and consequently it has always provided an independent, lively and, a times, outspoken forum for service debate. The end result is an unusual but very readable and wide ranging book which gives an account of the Royal Navy's role in war and peace, as seen through the eyes of contemporary naval offices during the last 100 years. Excellent. Published to celebrate the 100th Anniversary of the professional journal the ‘Naval Review’ this is a fine piece of work and a real tour de force covering the past century of both the NR (the Naval Review) and the RN (Royal Navy). It cannot have been at all an easy task to plan, scope and select material from the many thousands of pages contained in the hundreds of editions of the Naval Review over the years to provide such an interesting, wide, yet comprehensive and balanced coverage of such an enormous subject. It was a very ambitious undertaking and all credit to Peter Hore, the editor for achieving such a magnificent result, not forgetting the splendid scholarship of the distinguished band of contributors. The book is most certainly a fine tribute to the Review and of course to the Royal Navy, which as Peter Hore says “..has played such a prominent role at almost every level of British and international culture, strategy, discovery and technology, and amassed a rich legacy..”. ‘Dreadnought to Daring’ is, in all respects, a remarkable achievement and will undoubtedly become a key work of reference for all serious naval historians. I look forward to spending many more fascinating and enjoyable hours “engrossed in the pages”. One hundred year of naval debate and thinking in the aval review – the quarterly journal encouraging serious discussion of RN issues of the day – is celebrated in a centennial anniversary book.